First Wednesday of the month throughout 2019, 7:30-9:30pm – Craig’s Royal Hotel, Ballarat. A different theme each month. Free entry: pay-what-you-feel for the music. Wednesday 6th Febuary 2019, 7:30-9:30pm – Craig’s Royal Hotel, Ballarat. Great Old Songs from the folk, jazz and blues traditions (plus a few originals) with Geoff McArthur. Free entry – Pay-what-you-feel for the music. Wednesday 2nd January 2019, 7:30-9:30pm – Craig’s Royal Hotel, Ballarat. Songs from the 1930s & 1940s to put a smile in your heart and a swing in your step. Free entry – Pay-what-you-feel for the music. Wednesday 5th December 2018, 7:30-9:30pm – Craig’s Royal Hotel, Ballarat. All the grit, passion and poetry of Tom Waits songs sung with a sweet voice and smile. Free entry – Pay-what-you-feel for the music. Wednesday 7th November 2018, 7:30-9:30pm – Craig’s Royal Hotel, Ballarat. A tribute to Leonard Cohen – songs and poems to mark two years since he left this earthly realm. Free entry – Pay-what-you-feel for the music. French songs? Stories? Swing? Smiles? Oui, oui, mon ami! The trio is set to serenade you with all those beautiful French songs and whisk you off to France with tales of my recent adventures in the land of cheese and ridiculous accents. Friday night tunes to get the weekend off to a good start. Come and have a drink with your friends or make some new ones while I sing good old songs and tinkle the ivories of the freshly tuned grand piano. Singing, playing piano and ukulele and maybe even a little double bass. French songs, tunes from the first half of the 20th century, Leonard Cohen, Tom Waits, and other random bits and bobs for your ears to enjoy. with my ukulele, of course, singing great songs. MELBOURNE UKULELE FESTIVAL at The Croxton Park Hotel, High St Northcote. Amie Brûlée and the National Trust are joining forces to bring you a fabulous Vintage Garden Party to begin the summer. Entry includes exploration of the magnificent Art Deco homestead (open 12.00pm to 2.00pm) and full access to the fantastic walled grounds, with the Spring gardens in full flower. Pop Up Bar by Taltarni winery from Avoca, with their great range of quality sparkling and still wines. Amie Brûlée and the National Trust are joining forces to bring you a fabulous Vintage Garden Party to begin the summer. Listen to some great tunes from the swing era and hear fascinating snippets of Claire and Scobie Mackinnon’s story. Pop Up Bar by Blue Pyrenees winery from Avoca, with their great range of quality sparkling and still wines. Best dressed competitions, including the best stylish summer hat. Limited tickets are available for this elegant event and they are sure to sell out quickly. The All-In Musicians Extravaganza where a bunch of musicians from the festival get together and play a whole stack of tunes. Surprises and a good night guaranteed. Singing songs from my new album with my little ukulele. There’s a great lineup of musicians and bands playing from 3-6:30 and it’s free entry. Join me for a glamorous evening while you learn the production process, history and art of tasting Champagne. When I’m not singing I lecture in French wine at the University of Melbourne and to celebrate Global Champagne Day, I will be leading a workshop on the appreciation of the yellow fizz. Taste 6 Champagnes and sparkling wines, including one exclusive Champagne that cannot be found in any Australian wine shop. Tickets $150. Places are limited, so dust off your tails and book soon! Playing with James Clark (double bass) and Jon Delaney (guitar) at the Melbourne Ukulele Festival. This is always a fun weekend! Amie Brûlée and the National Trust bring that continental flair back to Mooramong for a fabulous pool party to end the summer. Dress in your best garden style and pack your picnic for an afternoon of music, revelry, garden games and 1930s glamour, tours of the magnificent Art Deco house and, of course, a dip in the pool. ∼ Pop Up Bar with special 1930s twist. Music to look at portraits by! Come and see Ballarat portraits as I sing songs with my ukulele for an arty afternoon. ‘Body of Work’ features portraits of people from across the Central Highlands community by a score of local & regional artists, and is being mounted in parallel with the Art Gallery of Ballarat’s hosting of the Archibald Portrait Prize exhibition. BACKSPACE at the Art Gallery of Ballarat Free! With the fabulous Sarah Carroll, Queen of the Bellarine. Sarah playing the first set, Amie playing the second, and I’m sure we’ll play a few tunes together at some point. Singing songs with my uke just like I’m chez-moi! Sat 22nd at the Ballarat Observatory for an all-acoustic, all-night gig with a bunch of great musicians. Sat 29th noon – Sun 30th noon – 24 hour piano marathon at The Lost Ones gallery. Have a look at the Festival of Slow Music website for details. With my swinging band in the stunning Minerva Space at the Ballarat Mechanics Institute. A vintage Saturday night for Heritage Weekend. Dance you socks off or be a wall flower, enjoy a drink from the bar, meet people, and spend a fun evening with great music. There are no rules – dress vintage if you like, you don’t need to be able to dance or have a partner. It’s just a good old-fashioned social night with dancing music. The BAR will be OPEN and you’re welcome to bring food. 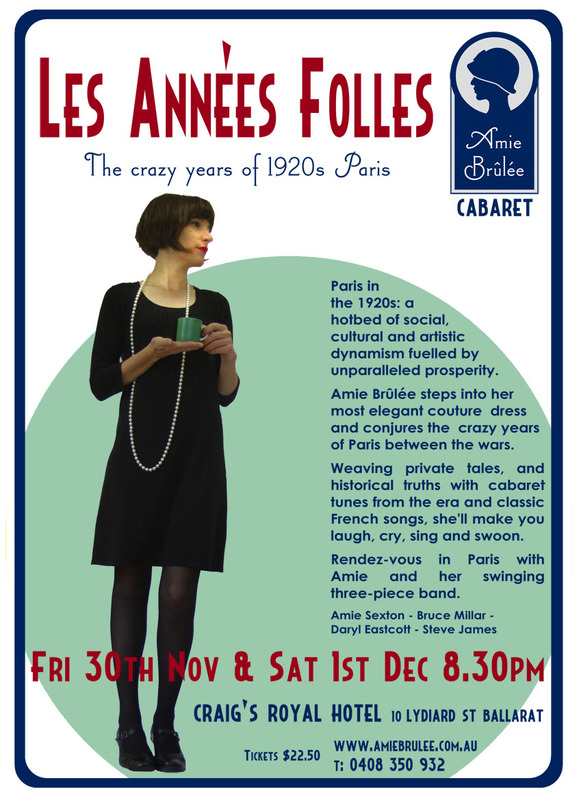 Step back into Paris of the 1940s for an evening of cabaret with Amie Brûlée. Accompanied by James Clark on his great big double bass and Myles White with his enchanting guitar, Amie brings you songs from the War years, from Edith Piaf to the Andrews Sisters, as well as stories from home and abroad. Dress the part for a soirée of vintage style and enjoy the show with a glass of wine and a nibble from the bar. Call the Gallery for tickets 5320 5858 or buy online. Solo set with my little ukulele (2:00-2:45) & a workshop (11:00 – 11:50). A weekend of ukulele goodness! Enjoy an afternoon of music, wine, food and good company with Amie Brûlée and Tim Drylie as they sing their way through some memorable melodies from the war years. From Cole Porter, Irving Berlin, The Andrews Sisters & Frank Sinatra to Glenn Miller, Vera Lynn and It’s a Long Long Way to Tipperary you will be humming along with them. You can also taste the gourmet delights brought to you by Benjamin’s catering and sit back with a beer or wine and relax with friends at the twilight end of another Anzac day. Open Studio, High St Northcote. I’ll also be playing with ‘Ukulele Stardust’ on Sunday afternoon at the Wesley Anne, doing all the songs from Willie Nelson’s 1978 album. It’s a stellar list of songs! Celebrate the release of the Beaujolais Nouveau – the newest vintage of rosé from Burgundy – with French songs and style. 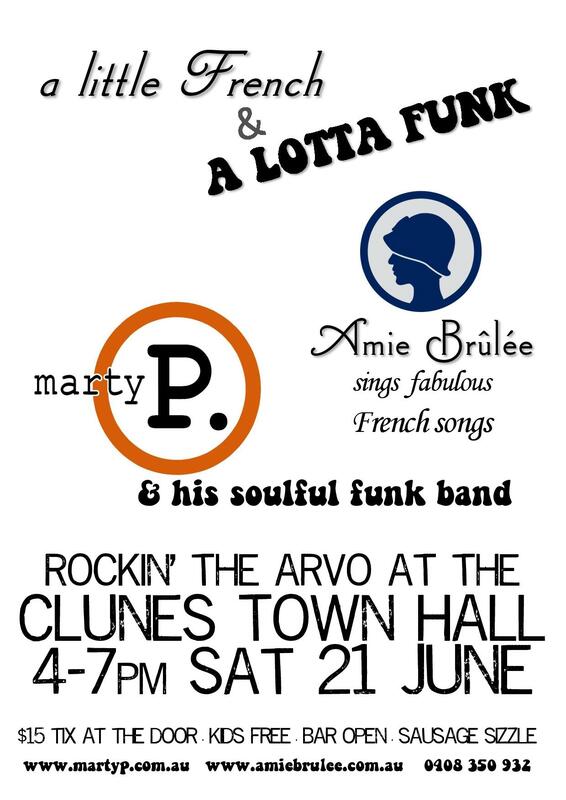 Amie sings her delightful repertoire of French songs with stories of wine and culture. Accompanied by the fine sounds of Myles White on guitar. The perfect aperitif for a Saturday evening! Tickets $20 book online here or cash at the door. Step into Le Salon Brûlée for an evening of great songs interspersed with the history of the Martini. While sipping your martini, you’ll discover where it was invented (not New York) and more secrets of this classic cocktail. Marty P sings and writes songs. Really great songs. He plays guitar and is helped out by a couple of ultra cool horn players. www.martyp.com.au Amie Brûlée will tell the tale of this stylish cocktail and join Marty to sing a tune or two. Inspired by the musical styles of Bing Crosby, Al Jolson, Al Bowlly and the many great songwriters and performers of the 1920s & 30s, John Hudson (guitar) & Peter Daffy (guitar) will be joined by special guests Matt Hewson (clarinet) & Tom Collins (double bass). Amie will join them for a tune or two, and rumour has it her nose-trumpet will be played. It’s so much fun we’re doing it again on the Ballarat Heritage Weekend! Whether you fancy kicking up your heels and dancing or sitting back with a drink, come along for an evening of vintage style. 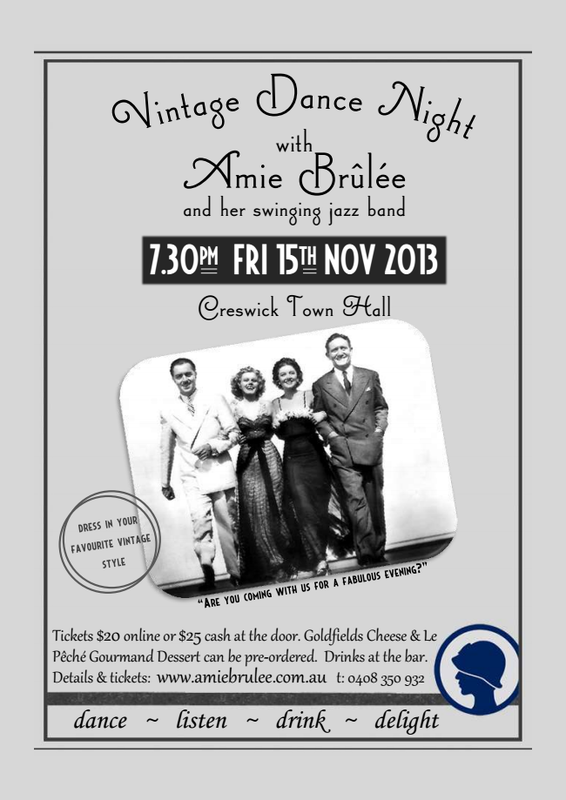 Amie Brûlée will be singing fabulous songs from the 1920s to the 1950s backed by her sizzling 4-piece band – double bass (Ian Riethoff), guitar (Myles White), drums (Daryl Eastcott) and trumpet (Sean Nihill). There’s no obligation to dance, you can just listen to the fine music, admire the couture and mix with an interesting crowd. Find your most stylish frock or suit and polish your shoes for some good, old-fashioned fun. Tickets: $20 online (click this link) or $25 cash at the door. Bar will be open & BYO food. Kick up your heels and dance like there’s no tomorrow with Amie Brûlée and her swinging 1920s-1930s style jazz band – double bass, guitar, drums and … trumpet! Good old-fashioned music that conjures up the spirit of dance halls of yesteryear in the beautifully restored Creswick Town Hall, only 15 mins from Ballarat or Daylesford. Find your most stylish frock or suit, and polish your shoes for an evening of vintage style and fun – there’s no obligation to dance, you can just listen to the fine music, admire the frocks and mix with an interesting crowd. The bar will be open for drinks and you can order a Goldfields Cheese platter or Le Pêché Gourmand dessert plate when you buy your ticket online. 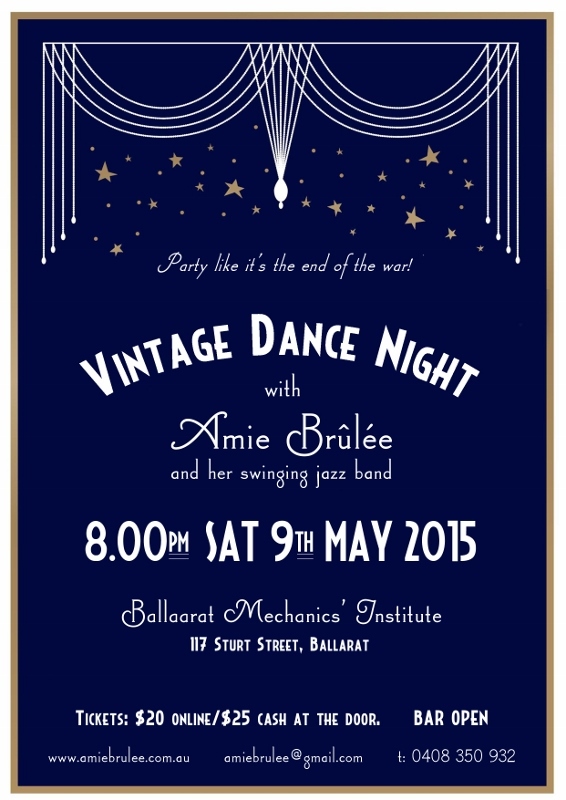 Tickets $20 available online here: http://vintagedancecreswick.eventbrite.com.au/ or $25 cash at the door. Amie Brûlée’s unique combination of French songs and stories has taken a left turn into the kitchen to explore the wonders of French cuisine. Structured like a dégustation dinner, Gastronomique offers ten courses of musical morsels and tasty tales of food, the French, and the cuisine of love and repulsion. Dining begins with a strong espresso to set the audience’s palate for a menu du jour that may include the myriad qualities of egg yolks, the characteristics of a perfect baguette, the dubious origins of macarons, the emotional power of raspberries, how to indulge in pungent cheeses without being socially ostracised, the art of seduction down culinary avenues, and just how fine the line is between indulgence and intoxication. Evoking the impeccable Parisian hostess of yesteryear, Amie Brûlée serves her cabaret cuisine in vintage style with a dash of history, a cup of culinary insights, and a grind of peppery surprises. Oh mon dieu, c’est délicieux! 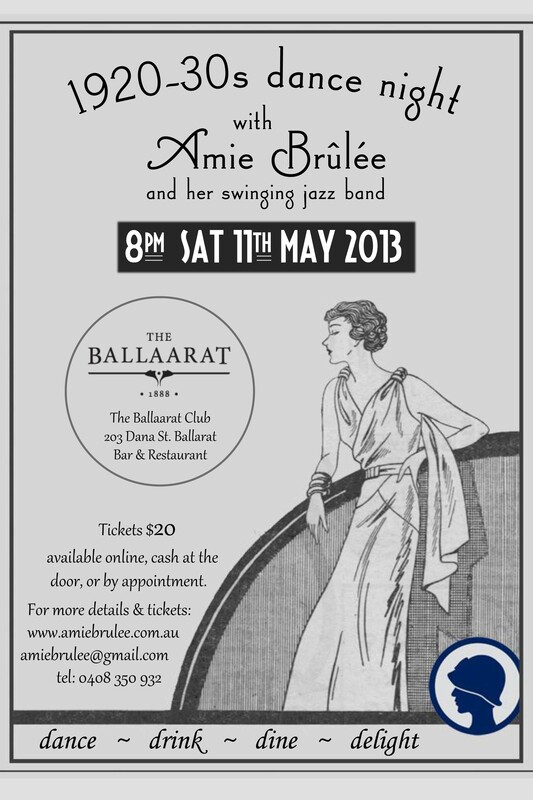 Kick up your heels and dance like there’s no tomorrow with Amie Brûlée and her swinging 1920s-1930s style band. Good old-fashioned music that conjures up the spirit of dance halls of yesteryear in the heritage surrounds of The Ballaarat. 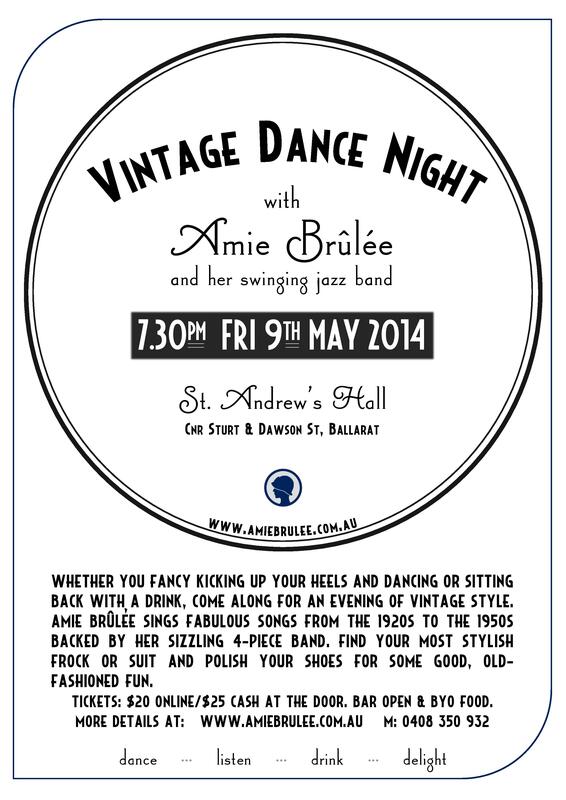 Find your most stylish frock or suit, and polish your shoes and your moves for an evening of vintage style and fun. Drinks and meals available at the bar and restaurant. “Ballarat Backyard Tasters”, a City of Ballarat FREE event from 5 – 8pm. Other musicians are playing plus Le Petit Patissier is providing tasty French morsels.